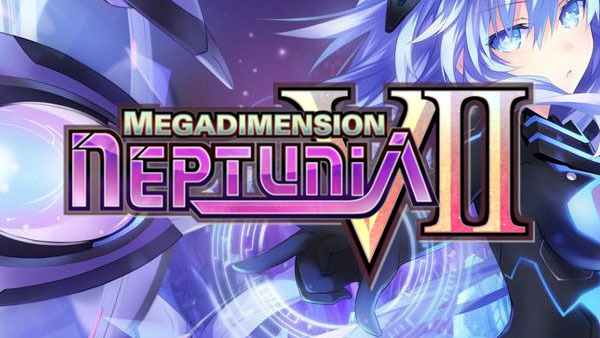 The logo for Megadimension Neptunia VII. 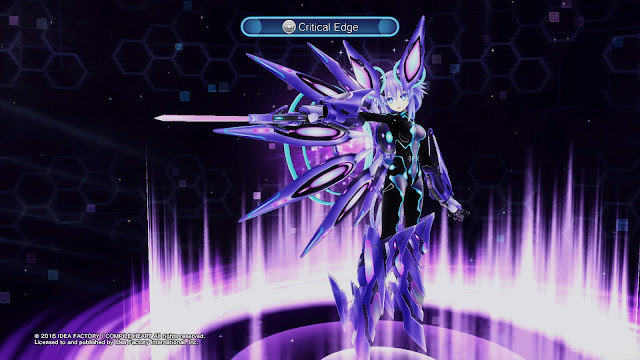 Megadimension Neptunia VII (henceforth referred to as Neptunia VII) is a JRPG (Japanese Role Playing Game) by Idea Factory and Compile Heart, and published by the former. It is the 4th installment in the main series (not counting the remakes of the first 3 games), and continues to add on to the ridiculousness of the series. 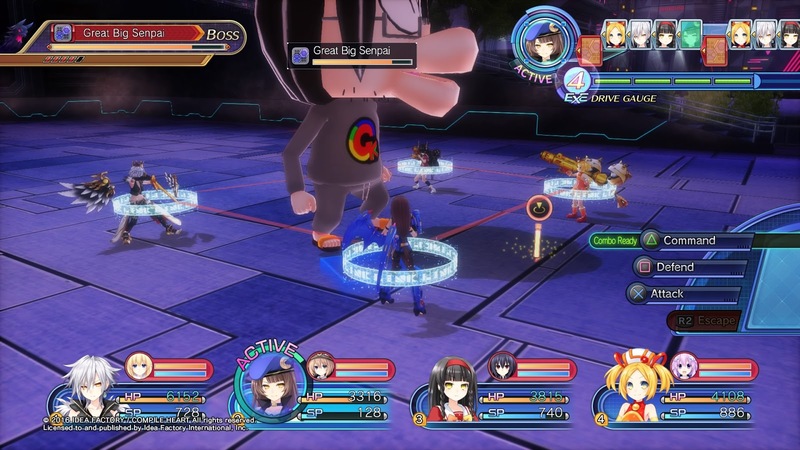 Set in the make-believe world of Gamindustri, a world created around the game consoles of the real world. The main heroine, Neptune, is the CPU - Console Patron Unit -, (the "gods" of this world) of Planeptune, and her entire design is based on the Sega Neptune console. The other CPUs follow suit, with Noire (the CPU of Lastation) being based on the PlayStation 3, Vert (the CPU of Leanbox) being based on the XBOX 360, and Blanc (the CPU of Lowee) being based on the Nintendo Wii. The story of this particular installment is convoluted, to say the least. 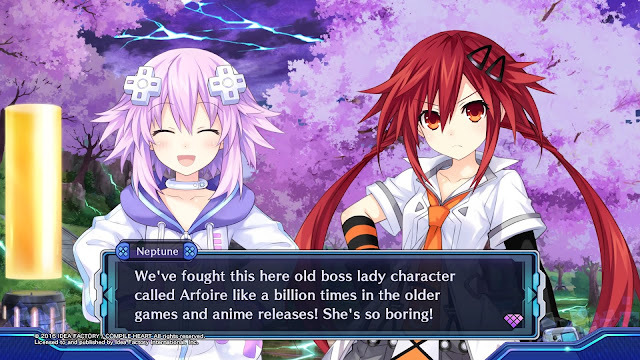 The main heroine and her sister are sucked into an alternate world by a broken game console, where they meet the only remaining CPU of that world, and her handsome talking fish companion. They then go on a journey, returning to their original world, as well as eventually going to yet another world. The game retains the series almost famous humour and fourth-wall shattering, keeping it fresh and funny despite so many releases. There are tense moments throughout the game, putting the heroines up against seemingly impossible odds, which are sporadically broken by our beloved heroine's fourth-wall shattering, and then triumph afterwards. The fourth wall means nothing in this world. Since the game is a JRPG, gameplay is expectedly grindy. It can take several levels before you're finally able to beat the mobs you're having problems with. The early game in this game is much tougher than the other games, as the early mobs have a chance to inflict status conditions, unlike the previous games. Early game combat is not a slug though, should you make use of your party to the fullest, as attacking the enemy's sides and rear deal extra damage. This extra layer of tactics at the beginning encourages you to explore how to fight, and the benefits of each character. Also added in this installment is an extension to the previous games' HDD (Hard Drive Divinity), called HDD Next. The combat system has once again been overhauled, now making all attacks critical hits if they fulfill certain criteria (for instance, using a power attack when no power attacks have been used in the combo). The area exploration mode is simple, featuring items and breakable objects, as well as the enemies to which you will fight. Combat is entered by running into them, symbol attacking them (allowing all your characters to move first regardless of the SPD stat), or being run into if the enemy detects you (which does the opposite of a symbol attack). It remains mostly the same as the previous games, which I think is fine as it is not the main focus of this game. The game, being available originally on Playstation 4, and then ported to PC, looks a lot better than the previous incarnations, which were released on PS3 (the original trilogy) and the PS Vita (the trilogy remake, as well as the spin-offs). However, as a port, this means graphic options for the PC version are limited, mostly only being the ability to turn off shadows and the outline effect, as well as V-Sync and resolution options. Depth of Field, and quality options for the textures and shadows are also present, though not varied in options. It is still moderately demanding though, and should be played on a quality PC from several years ago minimum, if possible. The combo system in action. 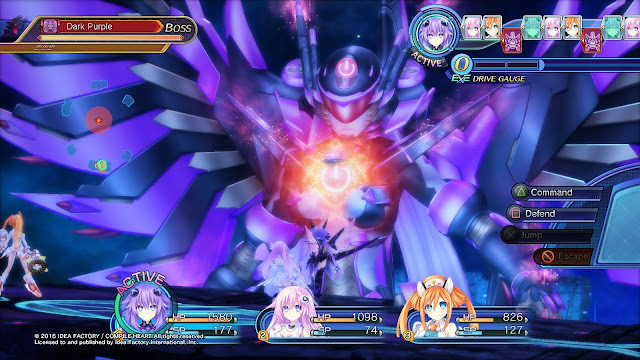 A special boss fight, one of the latest additions to the Neptunia franchise. It is highly recommended to play this on a controller, as would make sense for a console to PC port. It is optimised for the controller, and while it possible to play it on a keyboard (mouse does not have a function), it accentuates the clunkiness of the controls. Even on a controller, the controls in combat can be somewhat clunky to new players, though it can be easy to learn how to abuse the area attack targeters to hit multiple enemies at once. Neptunia VII has a very good soundtrack. Combat and overworld music depends on the world you're in, and exploration music depends on the theme of the area you're in. Cutscene music is fitting and doesn't seem out of place, though there are exceptions for comedic effect. 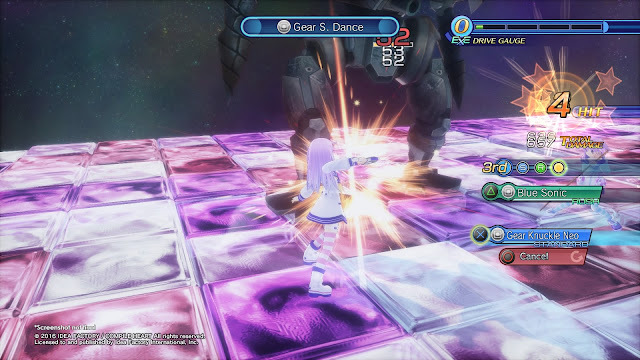 The sound effects in combat are exaggerated for impact, as is common in JRPGs and anime style games, though it can still be viscerally satisfying to listen to, if un-realistic. As is common for the main JRPG entries in this series, there are several endings depending on completion percentage and team composition, though the choice between the endings in this entry are a lot more obvious than in the other games. There are also several achievements which can take several playthroughs to obtain, though some are mostly just farming and time-consuming. Preparing to use an ability. Megadimension Neptunia VII is a stellar entry in the Hyperdimension series, with its graphical and mechanical improvements. JRPG enthusiasts and those who like cute games like this will find pleasure in this game once they get used to the unusual and unique combat system. Those who enjoy normal RPGs and are looking for a starter game to get into JRPGs may find joy with this game. Via Steam PC digital distribution, it costs €45.99 at full retail, and €49.99 via PlayStation store for the PS4. I found this price to be more than satisfactory for the amount of enjoyment I got out of it. Expect a lot of time out of this game, especially if you are aiming for 100% completion. Overall, I give this game a 4.5 out of 5, losing the 5 out of 5 due to the slightly clunky keyboard controls.